August 28, 2018 – This September, One&Only launches a tantalizing pop-up cocktail bar series in partnership with internationally acclaimed mixologists from around the world. For one month only, the One&Only Shake Up will see seven mixologists travel to each One&Only resort in the collection for a fusion of the finest drinks and exotic flavours, served with flair in spectacular locations. One&Only’s ultra-luxury resorts are set in some of the world’s most beautiful locales and known for their celebration of local culture, genuine hospitality, and unrivaled energy. The pop-up series will bring award-winning cocktail creators from some of the world’s best bars in London, Sydney, Miami, Bangkok, Durban and Johannesburg to showcase their inimitable finesse and skill for One&Only guests. Each talented mixologist will be serving bespoke blends inspired by One&Only destinations, as well as a selection of the signature drinks that have garnered them such worldwide acclaim. Russ McFadden, General Manager of Sydney’s jazz-infused speakeasy Eau de Vie, will be escaping city life for the World Heritage-listed Greater Blue Mountains, as he takes up residence at Australia’s leading ultra-luxury, conservation-based resort, Emirates One&Only Wolgan Valley. Guests can enjoy cocktails created by Russ including The Night Owl, an invigorating blend of Patron Silver, Rockmelon, White Ale and Yuzu Soda, inspired by the Southern Boobook Owl, native to Australia. Russ will be running Masterclasses for One&Only guests where they can learn how to make three selected cocktails and discover the history and stories behind them. A one-night stay for two people in a Heritage one-bedroom King Villa at Emirates One&Only Wolgan Valley starts from $1,955 (plus taxes and fees) in September and is inclusive of gourmet breakfast, lunch and dinner, selected alcoholic and non-alcoholic beverages, and two on-site activities per person. Celebrate Mexican Independence Day at One&Only Palmilla, the iconic Los Cabos resort, as Nick Nistico from Sweet Liberty takes over Agua Bar. Sweet Liberty was recently ranked #27 in The World’s Best Bars and Best American Bar Team in the Spirited Awards hosted by Tales of the Cocktail. Guests can embrace the occasion with Nick’s Mexican-inspired blend, Mezcalero, made from Mezcal, Aperol, chocolate bitters and a grapefruit twist, or enjoy classics from the award-winning Miami bar including Sweet Liberty Pina Colada. Continue the fiesta at Agua by Larbi, the resort’s farm-to-table Mexican restaurant, which will be serving a celebratory special menu. A one-night stay in an Ocean Front Room at One&Only Palmilla starts from $640 (plus taxes and fees) in September. Peter Good, from Johannesburg-based Mootee Bar, brings his unique African-inspired story-telling to One&Only Le Saint Géran in Mauritius. The long-celebrated resort reopened in December 2017 following a multi-million dollar investment and is redefining ultra-luxury in the Indian Ocean and beyond. Taking up residency at La Pointe, the chic feet-in-the-sand bar located on the edge of the resort’s private peninsula, Peter will be serving rum-based blends for guests to enjoy alongside the spectacular sunset views. He will also be hosting an exclusive cocktail masterclass with food pairings at the acclaimed steak restaurant PRIME, while those seeking a detox day, can partake in crafted relaxation mocktails at the One&Only Spa, or energy-boosting beverages at Club One. A one-night stay in a Lagoon Room at One&Only Le Saint Géran starts from $595 (plus taxes and fees) in September. London bar The Gibson ranked #6 in The World’s Best Bars in 2016, the year it was opened by Marian Beke. The renowned mixologist brings his 1920s-inspired creations with exotic ingredients and flamboyant garnishes at One&Only Royal Mirage in Dubai, a palatial sanctuary set in 65 acres of lush gardens and a kilometre of private beach overlooking Palm Island Bay. Guests will have the opportunity to take part in a Masterclass with Marian and learn the secrets to mixology from the man behind some of London’s most successful cocktails bars, as well to experience a selection of his signature beverages at Celebrities. A one-night stay in an Arabian Court Deluxe Room at One&Only Royal Mirage starts from $305 (plus taxes and fees) in September. Located on the furthest tip of The Palm’s West Crescent, One&Only The Palm, an intimate enclave with modern Arabesque design, will welcome Bryan Pietersen from acclaimed London bar Purl. The pop-up takes place at 101, a chic over-water lounge next to the resort’s private marina, boasting breath-taking views of the iconic Dubai skyline. Guests will be able to sample Purl’s multi-sensory cocktails, including Mr Hyde, Cerez Joker and Mind The Gap, inspired by classic recipes from the prohibition era with an added flair and creativity. A one-night stay in a Palm Manor Premier Room at One&Only The Palm starts from $654 (plus taxes and fees) in September. The owner of Durban-based Lucky Shaker, Michael Stephenson, will be taking over Vista Bar at One&Only Cape Town, for a weekend of seasonal drinks served in fun and innovative ways. 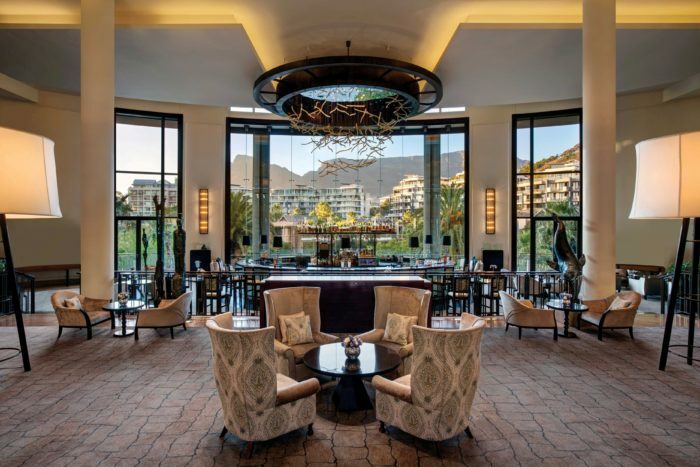 Guests can enjoy cocktails from the award-winning mixologist, who has represented South Africa in a number of cocktail competitions while taking in expansive panoramic views of Table Mountain. One&Only Cape Town is located at the bustling city’s fashionable Victoria & Alfred Waterfront, offering spectacular views, world-class dining, unrivaled accommodation and access to the city’s most fascinating sights and characters. A one-night stay in a Marina King Room at One&Only Cape Town starts from $631 (plus taxes and fees) in September. From the bustling streets of Old Town Bangkok to the pristine white shores of One&Only Reethi Rah, Ku Bar is transported to an idyllic island paradise for an exclusive three-day pop-up. Voted one of Asia’s 50 Best Bars 2017, Ku Bar spotlights local ingredients, attention to detail and sophisticated techniques. Surrounded by the crystal blue waters of the Indian Ocean, One&Only Reethi Rah in the Maldives is an ultra-luxury, all-villa resort offering an unrivaled level of seclusion, freedom, and activities to discover. A one-night stay in a Beach Villa at One&Only Reethi Rah starts from $1,650 (plus taxes and fees) in September.